I don't think I can go back to using another top coat after this. 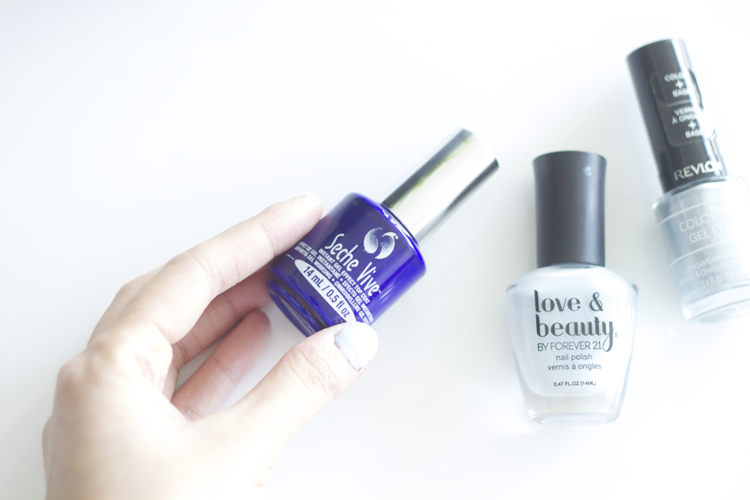 To really put Seche Vive to the test, I conducted two tests that reflect my lazy and sloppy nail regime. I wish that I had the patience and skill to put nail polish on perfectly every time, but I don't. 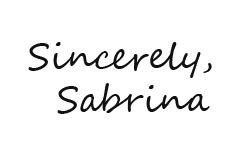 So for you nail polish amateurs out there, this review is for you. First, I used Seche Vive over cheap nail polish from Forever 21. Normally without top coat, I'd start to see chipping after about 5 days of wear. Seche Vive managed to double the life of my polish. If this is what it does to cheap polish, I can't wait to try this on top of the nice stuff. Plus, the "instant drying" label really rings true - I was able to go about my normal business in about two minutes after applying. Next, I was in a hurry one day but needed some colour on my nails. So I sloppily brushed on some polish, including committing the sin of putting a second coat on before the first coat was dry, which caused an uneven mess. 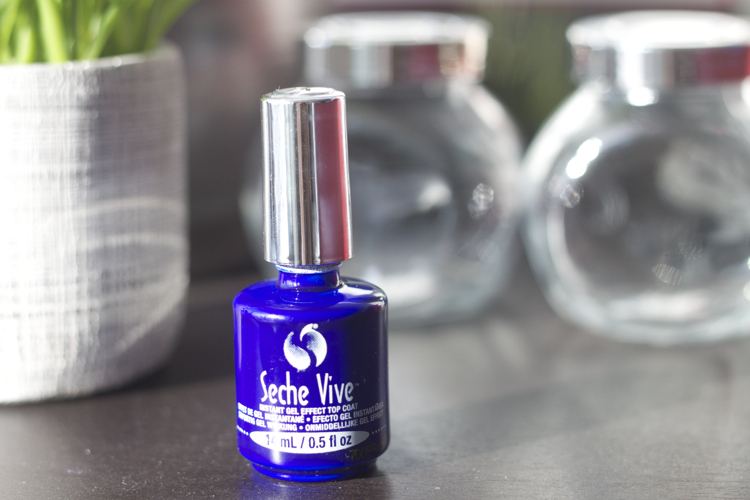 With one swipe of Seche Vive, the gel effect kicked in and smoothed over the blotchy patches of nail polish to create one seamless finish. This is a serious game changer. For someone who is a little clumsy with using my hands while my nail polish is supposed to be drying, it's a big plus that my mistakes can be smoothed over so easily. I tend to get sucked into buying poor quality nail polish from time to time, especially when it comes to bold colours. It's nice to know that I can spend less money on nail polish. But if I invest in a good top coat like Seche Vive, I can prolong the life of my nail polish wear and give it a more professional finish. Definitely would buy this again. Get this from Nail Polish Canada - it's worth it.